A large issue we have had on our site is getting members to come back to close their questions and reward the experts who dedicated their time to giving a solution. We want to make sure we have systems in place to properly reward experts and identify the correct solutions if an author abandons their question. If a question has not received a comment from anyone within the last 14 days it goes into a new “Inactive” state. Participants can request to close the question by selecting the best/assisted solutions. If closed by a participant, it triggers our standard “Close Request Pending” process where Participants, Authors, Mods and TA’s have the 4 days to object to how the question is being closed. Objecting to an close request will no longer automatically file a request for attention. The ability to request attention is available for anyone to use as necessary. Currently, a member’s question wizard is locked when they have an abandoned question (14 days of no comment by the author). 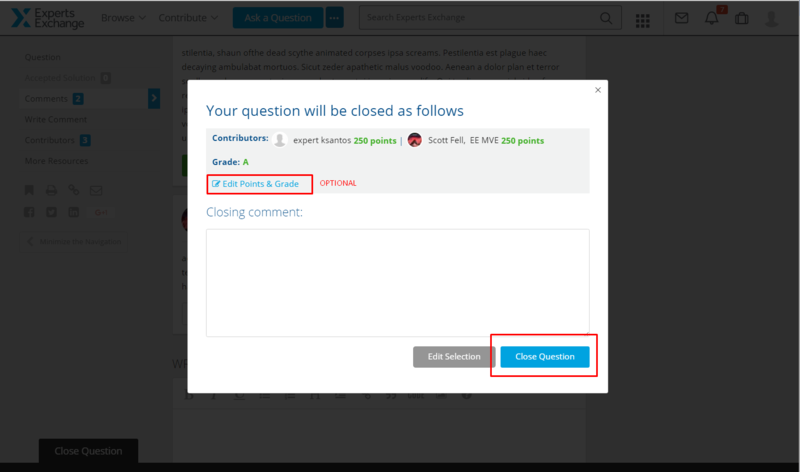 We have removed this lock since the question can be closed by someone other than the author in the inactive question state. If I elect to close a question this way (Help Resolve this question) and I click the Close Question button, how do I assign equal points? "Best" does not allow equal points. How do I assign equal. Thanks. Edit Points & Grade. Personally, I split it down the middle as close as it will allow me. Thanks. I will try this. I screwed up the last question I closed. I am a participant in a question which is now in abandoned state and I am unable to post a comment. I do have the option to chose a solution. Don't you have "Add new Comment" in the "Write" box? Oh yes, I just noticed it. So the comment box is not open by default. My bad Sir!